Billy Sheehan is returning to Australia NEXT WEEK for a clinic tour. I haven’t seen any press at all about this one, so let’s spread the word! Retweet! Forward! Email! Shout! And whoever’s responsible for publicising the tour, um… if I didn’t hear about it until I went to Billy’s Myspace today, and I’m a huge geek about this kind of stuff, uh… well… that’s not great. Here are a couple of DiMarzio videos featuring Billy. In this one he talks about discovering hammer-ons from under the shadow of Billy Gibbons’ cowboy hat. And here he shares a secret trick about his unusual picking technique. This one’s pretty freaking amazing. CLICK HERE to buy Billy’s new CD, Holy Cow, from Amazon.com. CLICK HERE to follow Billy on Twitter. CLICK HERE to follow DiMarzio on Twitter. Here are a couple of great new DiMarzio videos featuring Billy Sheehan. And here he shares a secret trick about his unusual picking technique.This one’s pretty freaking amazing. 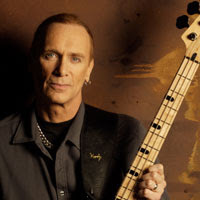 The latest Talking Metal podcast(episode 261) includes a great interview with Billy Sheehan about Yamaha Attitude basses, the Mr. Big reunion, his solo album Holy Cow, collaborating with guys like Terry Bozzio, Tony MacAlpine and Bumblefoot (not together – imagine what an awesome band that would be) and those rumours that David Lee Roth tried to reunite his classic Eat ‘Em And Smile band a few years ago. I only discovered Talking Metal a few months ago (I kinda avoided listening to podcasts for the longest time because I knew that I’d find it addictive once I started) but it’s essential listening. Check it out! Recent episodes have included awesome interviews with Duff McKagen and drummer Richard Christy.